Mark Kelly is a graduate of both Wilfrid Laurier University B.A. (Hons.) and the University of Western Ontario (LL.B). 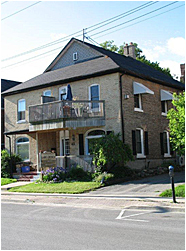 Mark has lived in the City of Barrie since 1989 and articled with a prominent Barrie law firm. Mark’s articles focused on litigation and he gained extensive experience in the field of criminal litigation with counsel of that firm, who has since been appointed as a judge to the Ontario Court of Justice (Criminal Division). The office is open from Monday to Friday from 9:00 am to 5:00 pm, although appointments can be booked after regular business hours in order to accommodate the working schedules of our clients. If you have just been arrested and need advice immediately from experienced legal counsel, Mark is available 24 hours to assist you at that crucial moment in your legal defence. Because of our commitment to provide quality legal services to all clients, Mark still accepts Legal Aid certificates on many Criminal Code offences. Flexible retainer agreements are also available in order to accommodate clients’ budgets. Your initial thirty minute consultation with Mark is free of charge in order to assist you with initial legal advice and retainer negotiations. Since opening his own practice in 1991, Mark has restricted his practice to the defence of people charged with Criminal and Highway Traffic Act offences. Mark is experienced trial counsel who has appeared in all levels of trial court in Simcoe County, including the satellite courts located in Bradford, Collingwood, Midland and Orillia. Mark has also regularly appeared in the courts located in Parry Sound, Bracebridge, Huntsville, Lindsay, Newmarket and the greater Toronto area. Mark has been actively involved in the administration of criminal justice in the County of Simcoe throughout his career. He was the President of the Criminal Lawyers’ Association of the County of Simcoe (2009 – 2011), and has been its Vice President in the past, as well as serving on the Local Courts Management Advisory Committee for several years. These activities have provided Mark with the opportunity to establish a professional working relationship with Crown Attorneys and court administrators, all of which benefits his clients’ interests greatly. Mark currently serves as the representative of the criminal defence bar on the executive of the Simcoe County Lawyers’ Association. Because we understand that dealing with being charged with a Criminal offence or a Highway Traffic Act offence can be quite stressful, we want to assist you in achieving the most beneficial, effective, and timely resolution of your case.